As the strobes flashed, and the smell of Burmese food was in the air, I began to get a little nervous for Myanmar’s first ever Help-Portrait event. We had 85 volunteers, 10 pounds of chicken, 15 pounds of rice, 5 hair and make-up stations, printers, a laminator and 6 studios ready to go for portraits. We waited anxiously for people to come, and we had no idea how many people to expect. 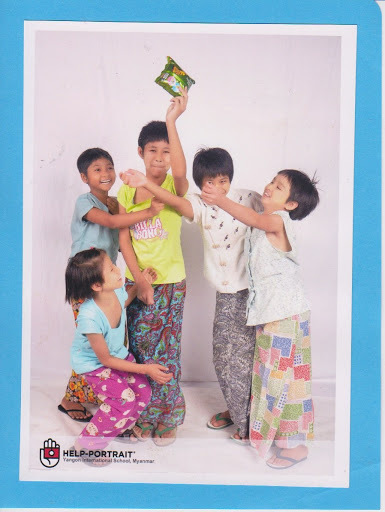 Here is a picture of the girls goofing around with one of the juice packs. We had a company show up (I didn’t even know about this!) and donated 500 glasses of lime juice for the event. This was crucial to keeping a lot of us hydrated! 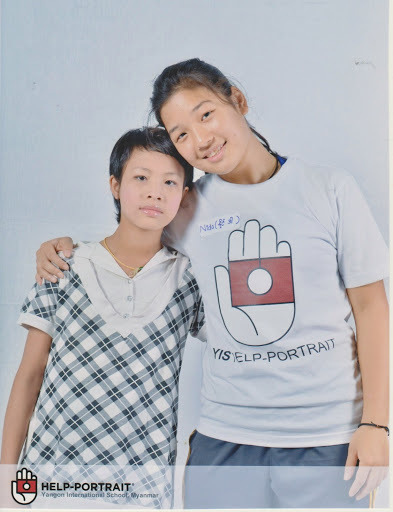 The girls came from another senior student who volunteers time at the monastery working with some of the orphans. 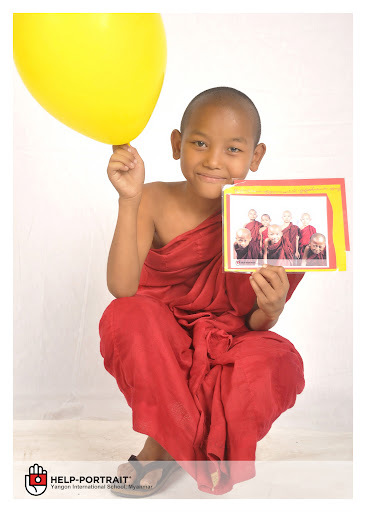 They all had similar stories – no parents, living together at the monastery, and becoming educated through the monastery and the government schools. Below a picture of senior, Nida, who did a wonderful job in helping with this event. Her family contributed a lot of time and effort into making this event a success. She is pictured with one of the girls that she brought. What an amazing event. I wish I could have been taking pictures and doing more of the “art”, but it was just as fun to run around, troubleshoot, announce things like missing children on the mic, and keep everything running. I am very thankful for this opportunity, and could not have been accomplished without the different team leaders, team members, and YIS for allowing us to use their facilities. Our total numbers registered were 237 families. We printed off over 350 portraits for these families!!! We served meals to over 300 people, and we had 85 volunteers working for us. We raised over $1200 in donations of food, clothes, printing, laminating and paper. Not bad for a first year, eh??? I’m so thankful that my prayers were answered, and that so many people sacrificed time and money to make this event a success. The professional photographers that Mie Maung and Wunna brought in were incredible, and the donations from one of our students, Lou Maw, donated and made all of the backgrounds you see in these images. YIS Students rocked, especially the 7th grade students! The parents of the students chipped in, and all of this service blew me away!